Anyway, onto the polish! This collection consists of 5 tropical inspired gel polishes - 1 crelly, 1 glitter crelly, 1 shimmer, 1 frost and 1 glitter. It is certainly a nice mix of finishes. These have been available at Sally Beauty Supply for a few weeks now, but you should still be able to locate them if your local store hasn't sold out. The first shade in the collection is Magenta Mambo. This is a gorgeous, almost frosty, shimmery pink with a purple flash. My camera insisted on picking up more of the flash than the actual color of the polish. It is much bolder and more pink in person. I found this one to be opaque in two coats, but swatched three as usual for consistency. Next up is Lots of Luau. This bright, lime green crelly base is loaded with silver holographic glitter. I found this one really needs three coats for even glitter coverage as the glitter likes to drag down the nail. You can see a small bald spot in the glitter on the side of my pinkie nail in the swatch below. The holographic effect of the glitter is a bit muted in the crelly base and didn't really pick up in the photo, but it does show in person. Habanera Hottie is a warm toned, medium orange crelly that is almost a jelly. This one is almost opaque in three coats but will need four if you have a strong visible nail line like mine. Chica Chica Boom is my second favorite of the collection. We're talking tons of purple glitter packed into a clear base that offers opaque coverage in three coats. It can also be used as a topper with just one coat. The glitter itself is cool toned purple that flashes a more red toned purple when the light hits it. This photo does not do it justice. Finally, Bahama Mama is my personal favorite from the collection. You know how much I love my blues! This is a medium blue base that is loaded with a frosty silver shimmer. It absolutely lights up in direct lighting. I loved Bahama Mama so much when I swatched it, I couldn't resist making it my mani for the week. I stamped it here with an image from plate 26 from the Pueen Love Elements set. It's amazing how much I use this set - it was my first of many stamping plate purchases and I still love it even though my collection has grown considerably since then. The silver stamping polish is Pure Ice Silver Star (formerly Silver Mercedes). Silver star is my absolute favorite silver for stamping! I stocked up. :) I then finished with a simple silver stud as an accent nail. The mani photo above shows what Bahama Mama looks like in less direct lighting. Just gorgeous! 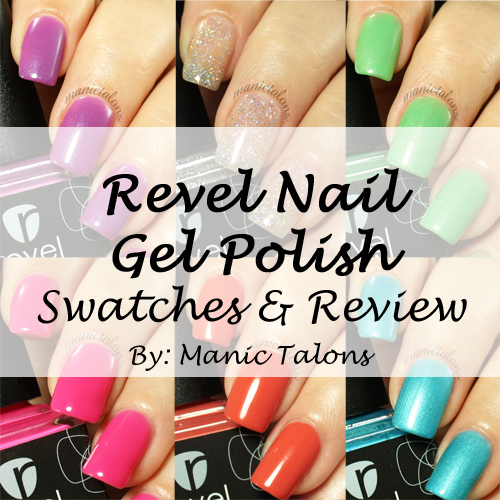 *The gel polishes featured in this post were a contest prize from FingerPaints Nail Color. This post uses Amazon affiliate links. Purchases through these links generate commissions that help fund this site. Hello Loves! Just a quick off schedule post to announce that I am guest blogging at Imperfectly Painted today while Stephanie is on vacation. Click here to pop on over and see this design in full color and find out which polishes I used! Hello Loves. I'm really excited about today's nail art! As you know from previous posts, I can't use tape to save my life. I have tried and failed so many times I swore off tape forever. Well, today I have a "tape mani" to show you! But I didn't use tape. Nope, I used vinyl stencils from NeverLand Lacquers (formerly Pop Culture Cosmetics). For this design, I started with a base of Daisy Duo Papaya Whip. I applied the top coat, cured, and removed the tacky layer. I then applied the simple stripe vinyls to block out the design and used a fine brush to fill in the blank spaces with Daisy Duo Melting Violet. I cured again, then used a pair of tweezers to remove the vinyls (pull at a sharp angle to get a clean edge). I added a few dots of Melting Violet after I removed the tape, cured the dots, then topped it all off with a a gel top coat. As I mentioned in last Wednesday's post, these two colors were simply made for each other! This is my first time using nail vinyls, and I couldn't be happier with the results! If you've ever tried to do a tape manicure with gel polish, you know that getting the tape to really stick to the nail is crucial to prevent seepage and get a crisp line. I haven't managed to accomplish that with my many tape attempts in the past. I didn't have that problem at all with these vinyl stencils! These babies stick. I love them so much I just couldn't stop! 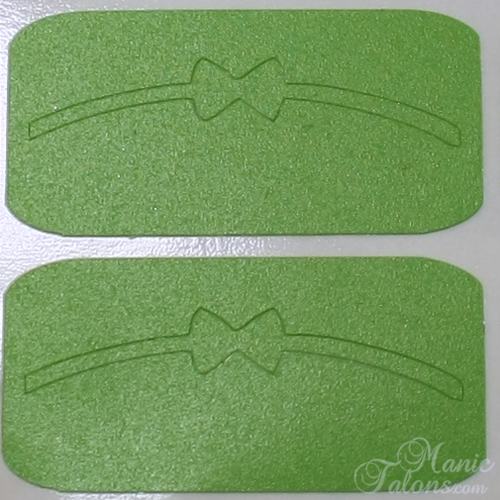 I'm doing a wear test right now, but I couldn't resist spicing up my plain mani with an accent nail using these adorable french bow nail art stencils. 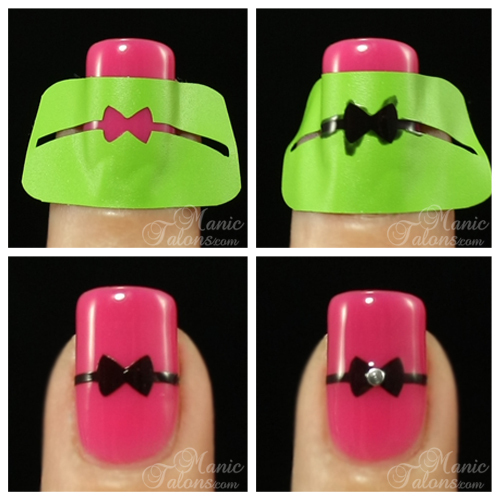 I love that this particular design can be used in two different ways - you can use the outer ring and fill in the bow with polish or apply the bow and paint over it. So you get double the number of uses. I took a few shots of the process when adding the bows to my ring fingers. The steps are pretty simple. 2) Use a pair of tweezers to position the stencil, then press it firmly to the nail. 3) Fill in the areas where you want the 2nd color. I used a small detail brush, but you can use the polish brush if you prefer. 5) Remove the stencil by gently peeling it off the nail. Use a sharp angle to produce clean lines. If you're a tape mani failure like I am, I highly recommend these stencils from Neverland Lacquers! I haven't tried other brands to compare yet, but these certainly beat the socks off of striping tape, scotch tape, painters tape and masking tape! I can't wait to try more of the designs! Be sure to follow Neverland Lacquers on Instagram and Facebook stay in the know about their many other great products! Hello Loves! Today is the big day - the release date for 12 more gorgeous shades in the KBShimmer line! I have 6 of the 12 to show you today, and I think you're going to like what you see. Mixed Peelings is an awesome, off white base packed with pink, yellow and green neon glitters of varying sizes. As with all of the KBShimmer polishes I've tried, this one applies smoothly. However, I did have to do a little fishing to get a good mix of the glitters, but nothing too difficult. I just swirled the brush around in the bottle between nails. The swatch below is 2 coats of Mixed Peelings over a white gel polish base. Peak My Interest is a pink crelly base that is packed with white triangle glitters as well as multiple sizes of hex glitters in pink and dark aqua. I didn't have to fish at all with this one, though I did need to position some of the triangle pieces once they were on the nail. 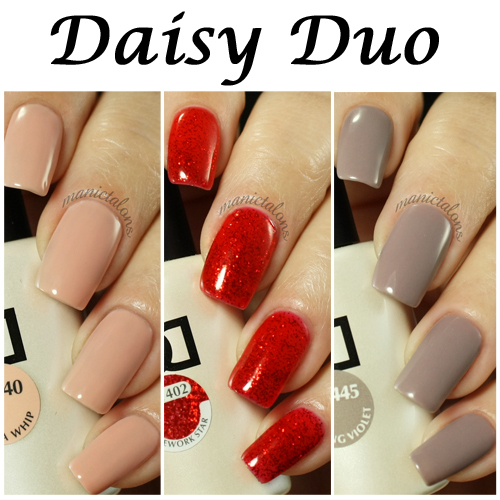 Below is three coats, though you could easily get away with two. Sea You Around is a polish that I just can't resist! This emerald green jelly base is loaded with fuchsia and silver circles and light blue hexes and squares. But that's only half of it! It also has fuchsia micro slivers and tons of sparkle. This one applied like a dream. No fishing or glitter placement! Sadly, my camera refused to capture all of it's glory. The base is much deeper than it appears here with a touch of teal. I swatched three coats as I found that the jelly base left a good bit of visible nail line with only two coats. Mint-al Vacation is a gorgeous, blue leaning mint holo. The holo in this one is subtle in most lighting. I absolutely adore it! This may be my new favorite mint shade. Application was very nice and it is opaque in 2-3 coats (depending on the thickness of your coats, of course). Red, White and Blue-tiful is a limited edition glitter top coat that is a must have for the 4th of July! The clear base is loaded with red, holographic blue and holographic silver stars. It also has fine red, blue and silver glitters and shimmer. I can't even tell you how much I love this topper! I had no trouble with the glitters at all - there are so many of them packed into this little bottle, it's impossible to pull the brush straight out without getting a good mix of stars and glitter. I have swatched it here as one coat over a white gel polish base. Finally, Happily Ever Aster is a beautiful glitter topper made up of multiple sizes of purple, lavender, white and light aqua hex glitters in a shimmery base. Like Red, White and Blue-tiful, this baby is packed with glitter. I tried it over several different colors, but I fell in love when I swatched one coat over a white gel polish base. The white glitters are lost over the white base, but the aqua and purple glitters simply pop! If you're reading from the U.S., head on over to www.KBShimmer.com to check out the other colors in this collection and grab your bottles. :) If you're not following KBShimmer on Facebook, take a peak there too for other blogger photos. This collection is packed with beautiful colors and finishes! If you're not in the U.S., check out www.HarlowandCo.org to get your KBShimmer Summer Collection fix! *The polishes featured in this post were provided by KBShimmer for my honest review. Hello Loves! I have something super exciting to share with you today! Everyone could use a little extra spending money right? Check this out! 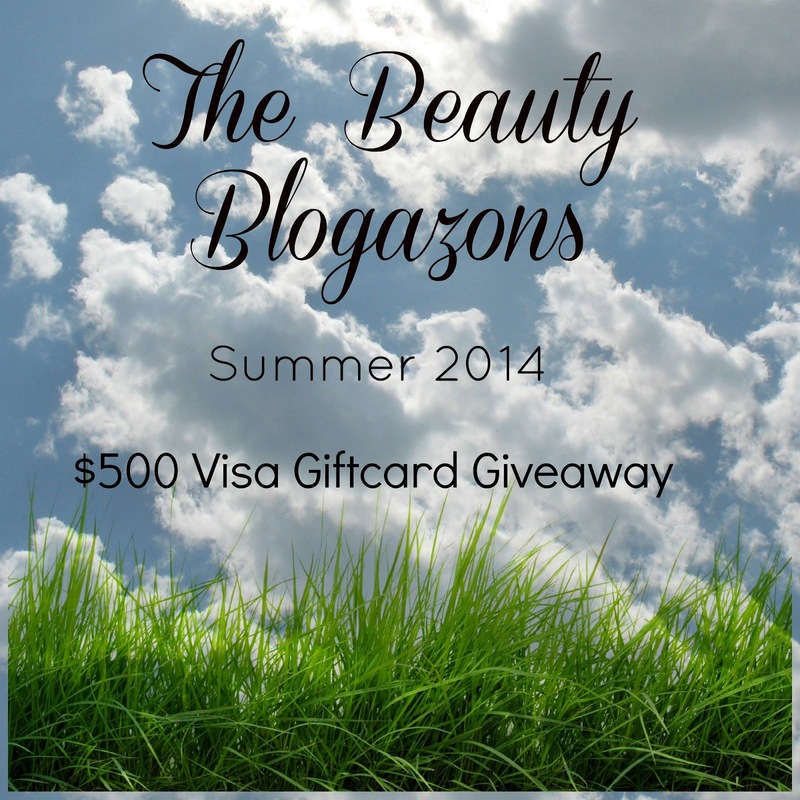 The Beauty Blogazons, a group of beauty, fashion and lifestyle bloggers have connected again to give away $500 of cold hard cash to get you ready for the Summer! Will you do a major beauty haul? Pick up the ultimate Summer wardrobe? Maybe pay a few bills? The choice is yours! Please take a little time to visit and thank all the bloggers that chipped in to make this happen. The giveaway ends on July 1, 2014 at 12:00 am Eastern Standard Time and is open Internationally! The full terms and conditions are available at the bottom of the Rafflecopter widget below. 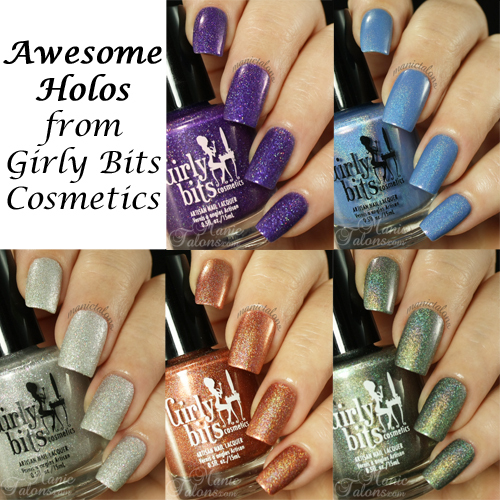 A Sample of Girly Bits Holos: Including 3 soon to be released shades! Hello Loves! I have a few gorgeous Girly Bits holographic polishes to show you today. This sampling of incredibly beautiful polishes includes three from the upcoming release and two equally amazing older offerings. Let's start with the beauties in that will be released on June 19, 2014. This may be my favorite of this release and the name suits it perfectly! No Such Thing as a Purple Problem is a royal purple base with scattered holographic shimmer. It absolutely explodes with color in direct light! I have swatched two coats here with one coat of Out the Door top coat. The next polish I have to show you is from the 80s Girl Bands Collection. I'm Your Venus is an amazing copper base with a linear holographic effect. The holo is much stronger in person - my camera didn't want to capture it in all it's glory. The second photo shows it a bit better than the first. The application on this one is as expected from Girly Bits - the polish glides on smoothly and effortlessly. This one can be worn in two coats, but I chose to go with three here. This is without top coat. The next polish I have to show you from the 80s Girl Bands collection is my favorite! Betty Davis Eyes is a finely textured, white silver polish with scattered holographic bits and a blue and pink shimmer. 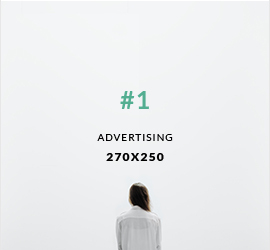 It is simply loaded with amazing dimension. My brain doesn't know what to do with it, so I'm not surprised that my camera didn't either. I was able to capture the texture, but not the shimmer. This one applies nicely - extremely well for a texture - and covers in two coats. I used three here. I did manage to capture a bit of the shimmer in this failed macro shot. Funny how that works sometimes. :) I should also note that two layers of top coat will make this one completely smooth and bring out the shimmer if you aren't a fan of textures. These next two are from previous releases, but too pretty to leave out of this post! First up is Bachelors Button. This is a pretty blue holo that almost leans periwinkle. The holo is linear but quite subtle, making this a very delicate polish in appearance. Like most Girly Bits lacquers, application is nice and the formula is flawless. This is three thin coats. Finally, I have one that I have debated ordering for a while because I knew I would want to show it to you, but the name made me pause. Pam decided it was time for this beauty to be mine and included it with the last round of press samples. She was right, it certainly belongs in my collection! D!ck In a Box is gunmetal grey base with a strong holographic shift. I absolutely adore it and it has just become my favorite holo in my collection! I love how the holo shift makes it take on a slightly olive tone next to my fair skin. Simply beautiful! Be sure to mark your calendar for June 19th for the 80s Girl Bands collection release as long as three bonus colors (including There's No Such Thing as a Purple Problem). Check out the other shades in the collection here! Be sure to follow Girly Bits on Facebook, Twitter and Instagram to stay in the know about new releases! Also, there are several Girly Bits distributors world wide, so be sure to check those out as well to find the best prices for your location! Are any of these beauties calling your name? I personally love them all! You're pretty much guaranteed to see these beauties as part of gel sandwich manis here in the future!